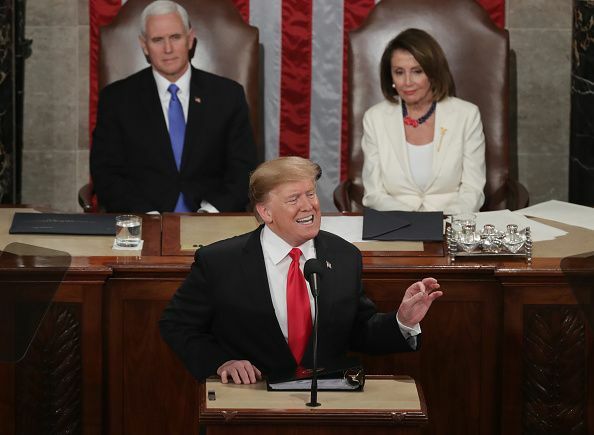 Republican lawmakers cheered President Donald Trump's call during his State of the Union address Tuesday for a federal ban on late-term abortions. "To defend the dignity of every person, I am asking the Congress to pass legislation to prohibit the late-term abortion of children who can feel pain in the mother's womb," the president said. Urging Congress to pass new legislation restricting abortion, Trump attacked a New York law passed last month that codifies women's abortion rights, as well as a now-tabled abortion rights bill in Virginia that the state's embattled governor, Ralph Northam, defended in a controversial radio interview. "Lawmakers in New York cheered with delight upon the passage of legislation that would allow a baby to be ripped from the mother's womb moments from birth,” Trump said. “These are living, feeling, beautiful babies who will never get the chance to share their love and dreams with the world." New York’s Reproductive Health Act, signed into law in January, legally ensures the right to abortion in the state, even if Roe v. Wade were overturned. It also expands who can perform abortions and allows abortions after 24 weeks if a woman's health is threatened or if the fetus isn't viable. "And then we had the case of the governor of Virginia, where he stated he would execute a baby after birth,” Trump added. Northam has seen backlash over remarks he made on a radio program supporting a Virginia bill expanding women's right to a third-term abortion. The legislation would have decreed that only one doctor is needed to determine a pregnancy can be terminated in a third-trimester abortion for the sake of a mother’s health. Current legislation requires a doctor and two consultants to make the determination. It also would have removed the 24-hour waiting period for abortions in the state. Only about 1 percent of abortions in the United States occur after 21 weeks, according to the Centers for Disease Control and Prevention, CNBC reported. Northam has been evading the press over a scandal resulting from a racist image in his 1984 medical school yearbook that shows one person dressed in blackface and another in the Ku Klux Klan's white hood and robes. "There could be no greater contrast to the beautiful image of a mother holding her infant child than the chilling displays our nation saw in recent days," Trump said in his address. Trump's comments on abortion in the State of the Union, while met with rapturous applause by GOP lawmakers, have drawn ire from abortion rights groups. “No one wanted to meet my living, feeling, beautiful baby more than me. No one is sadder that he will never get the chance to share his love and dreams with the world’ than I am,” Missy Kurzweil told Time magazine. “My choice to have a later abortion was an act of love to ease my child’s suffering. Shame on Trump for exploiting that love to appeal to his base,” added Kurzweil, who is one of dozens of women who signed an open letter about their abortions on Tuesday.